Miso Crafty Knits: Blogiversary Giveaway Winner! Congratulations! I'll be contacting you shortly to get your details so that your goodies can make their way to you! Thanks to everyone for entering and leaving a comment! 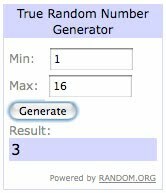 Like my last giveaway, I used the "True Random Number Generator". Only this time I finally figured out how to take a screen shot so that I could post up a photo of the actual "draw" of the winner. Yay for learning a new skill!